PNY Technologies® Inc. (“PNY”) world renowned manufacturer of USB and Memory products has officially announced the DUO-Link S for the Apple devices, offering a much more convenient alternative devices for all the iOS devices, it is an on-the-go USB Flash Drive that connects to your Apple devices via the built-in lightning connector to quickly and easily transfers files, one can directly access data on an external storage device and play movies or music without a network and without having to store them on your device and transfer or share files without connecting to one own computer or itunes, simply plug the DUO-Link S to iPhone, ipad, Mac or PC and enjoy quickly, easy transfer of files, since Apple devices do not offer expandable storage, you can use the PNY DUO-Link S to access large media files on the go and also expand the storage capacity on the devices. 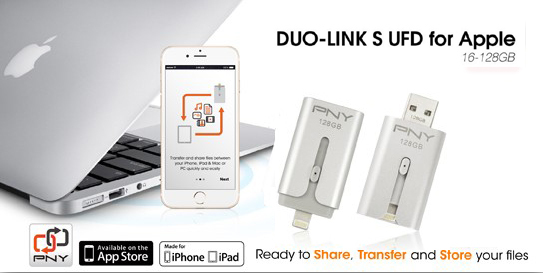 DUO-Link S comes with a standard USB interface as well as a lightning connector for connecting it to the iOS Devices and can use to free up spaces on iPhone or iPad. Users can also play music or video directly from the drive and the retractable design enables you to quickly reveal the USB Type A connector to plug in to your computer. It offers faster and more convenient file transfers without dealing with the hassle of bulky cables or wireless / PC connection. The PNY Duo Link S has a nice texture with the exterior of metallic steel with high quality of silver gray. The micro sized and cap- less design lets one to carry all additional photos, videos and files in one’s pocket without worrying about damage or lost caps, and it also does not require any charging unlike other OTG products and it is compatible with Apple lighting integrated and Type-A USB 2.0 connectors for sharing and storing content in iOS devices, which connects easily to MAC, PC or any Apple® devices enable one’s to access and transfer the files in seconds. The PNY Duo Link S is smaller compare to Duo Link M. It weighs around 11.8g and measures at 50.5mm L x 24.9mm W x 11mm H. The drive delivers an impressive performance and is available in storage capacities ranging from 16GB to 128GB. The Lightning interface delivers up to 10MB/s read, up to 8MB/s write. The USB Type-A 2.0 interface delivers up to 13MB/s read and 10MB/s write.